The archetypal Renaissance figure Leonardo da Vinci was truly a universal man (Ital. – uomo universale). There is no area of human activity that failed to attract his attention, or that does not bear a trace of his deliberations. In the field of fine art, Leonardo is famous for his masterpieces: the Mona Lisa, the Last Supper, the Virgin of the Rocks, and other, unfinished works, for example, St. Jerome in the Wilderness, and the Adoration of the Magi. He did not leave any works of sculpture, though he did create sketches and drawings. His legacy includes approximately 13,000 sheets of notes and drawings of anatomy, architecture, war and flying machines, plants and animals, all annotated in a reversed mirror-script. In his works of art, he brought his compositions to perfection by using the principles of perspective and the techniques of chiaroscuro and sfumato. Leonardo designed war machines and produced several plans and topographical maps for the powerful men of his time, under whose patronage he worked, such as dukes, kings and popes. This article presents a brief account of his most famous cartographical works: the plan of Imola, three topographic maps of Tuscany, the Chiana valley, the Pontine Marshes and western Tuscany, and a world map (Mappa Mundi). 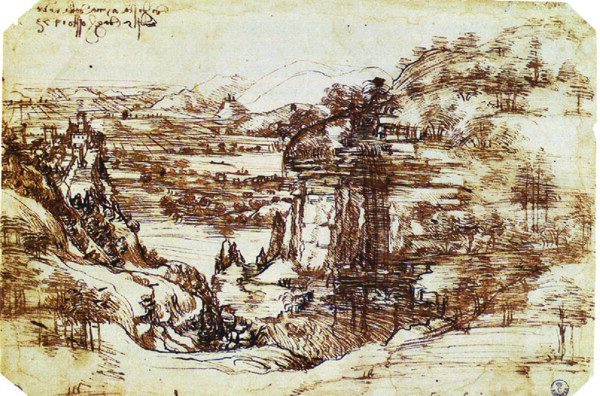 Leonardo skilfully made use of his fascination with landscapes, incorporating them as backdrops in his masterpieces.